There’s something very Zen about making beaded beads: Would the beaded bead exist without the beads used to make it? While I try to wrap my mind around that one, we’ve put together some fresh beaded beads patterns for you in our free eBook, Free Guide + Patterns to Learn How to Make Beaded Beads. Discover the intricate art of jewelry making! This free how to make beads tutorial contains various beading techniques for beginners and experts alike. Four of our best designers offer their professional advice on successfully crafting your own handmade jewelry. Make beaded beads from step-by-step patterns, specifically designed for you to create and enjoy! 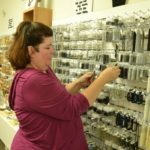 No matter what kind of bead you enjoy using most, chances are you can figure out how to make a beaded bead. 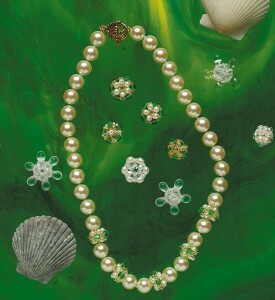 Beaded beads can be made from seed beads, fire polished beads, round glass beads, gemstones, or even crystal beads. The variety of beading patterns and projects come with great step-by-step instructions, colored diagrams, and materials and tools lists. Learn how to make beads using tubular peyote, herringbone, ladder, square and brick stitches. Try a few out and you’ll be hooked. So grab your needles and seed beads, and let’s get stitching! Create an entirely different style of jewelry with Cypher’s newly designed triangle bead. She was inspired by a strand of uniquely shaped wooden pieces. Using the peyote stitch technique, you can learn to make these eye-catching pieces. Materials and tools to craft these are minimal. Cypher even suggests you personalize these beaded beads instructions by stuffing them with herbs or scents, instead of felt. Follow the beaded bead instructions given by Cypher and you can successfully handcraft your own beads. Want to learn to make jewelry in 10 minutes? Cowart has designed the perfect project for you! These pieces take only 10 minutes to make. Techniques required to make these are netting and wire working skills. Make a necklace that can help you stand out in a crowd. 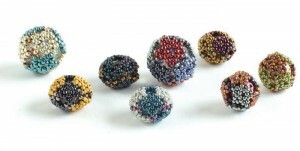 These pieces are stitched flat and then gathered together to form a spherical, gorgeous shape. Connect them together with wire-wrapped links that you can construct from a silver chain. 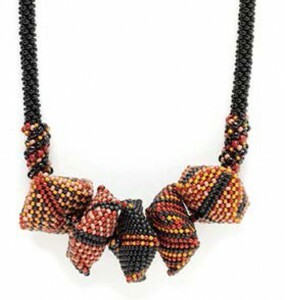 As part of the Beadwork magazine 15th anniversary beading contest, editor Melinda Barta designed this piece as part of a set that was to be used in a finished piece of beaded jewelry. 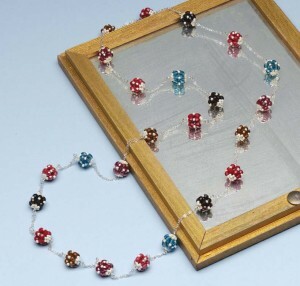 This beautiful beading pattern uses tiny seed beads and larger glass beads to create a delicate, lacey piece that looks stunning with gemstones or other glass beads. Use this beading tutorial to learn how to use peyote stitch to create a beautiful array of jewelry. Master the cross-weaving technique when you use these craft instructions to create a self-supporting necklace from just about any bead you have in your stash. 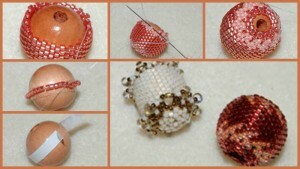 Round glass beads, drop beads, and pearls can all be used for this beaded bead tutorial. Learn how to make a beaded bead and use up any leftover beads you might have in your stash from other beading projects—these beaded beads will go with just about anything! Sometimes, making a magnificent necklace can be as simple as making an easy tube of peyote stitch, then adding strategic embellishments, like Lynn Davy did in her Treasures of Atlantis bracelet. Follow the easy beaded beads tutorial included in this beading project to make texturally rich pieces, then string them with your favorite gemstones and handmade glass beads for a striking, organic beaded bracelet project. Many beaders learn this beading technique by covering a wood bead with tubular peyote stitch! This beading tutorial takes you step-by-step through the process of covering a wood bead with peyote stitch. Find out the secret to holding your peyote stitch in place, get ideas for embellishments, and learn an easy method for making decreases and shaping your peyote stitch around a wood bead. Learning about bead making has never been more enjoyable! There are so many reasons to love beaded beads, and so many ways to make them. 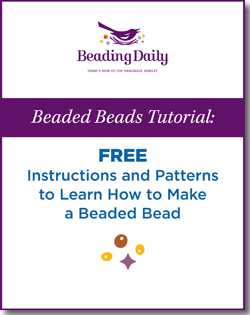 Enjoy our free eBook, full of instructions and patterns to learn how to make beaded beads, and see what else you can come up with on your own! With your free tutorial on how to make beads, you’ll have four beautiful beaded beads projects at your fingertips! What are you waiting for? How does one download the beaded bead tutorial? The link leads to a handmade bead tutorial which doesn’t include any of the instructions mentioned above.